Happy Bastille Day! While la fête nationale is celebrated every year on le 14 juillet in France, FIAF's annual street fest took place two days ago in la Nouvelle-York. Below is a sampling from this year's Bastille Day on 60th Street. Booths offering freshly prepared Gallic snacks and packaged foods lined the three blocks between Fifth and Lexington Avenues. A notch or two higher is the delicious Maille, whose Cognac mustard is outstanding. Other flavors include Noix, Bleu, Basilic, and Crème de Cassis de Dijon. Mange-ing merguez on le 14 is akin to eating hot dogs on the Fourth; having this grilled lamb sausage is de rigueur on Bastille Day. While merguez is typically served within a sandwich stateside, the sausage is eaten sans bread—using knife and fork—in France. Alas, in Le Souk's Franco-American adaptation, the baguette masked much of the flavor of the spicy little sausages. As in Paris, there were crêpe stands everywhere. Unlike Paris, however, these thin pancakes were considerably larger and far less delicate than their French cousins. The most popular (and slowest) among the foregoing stands was that of the Crêpe Café, whose filling choices included traditional sugar, Nutella, ice cream, and the all-time French classic, PB & J. Even after seeing how it was prepared, I rather enjoyed the simple butter sugar crêpe. Other sweets included the canelé, a Bordelais speciality. This baked delight consists of a dark, caramelized shell encasing a moist, custard-like center. In Bordeaux, it's often served with crème anglaise. The sweet treats from Canelé by Céline were good enough to be served in Bordeaux. As always, the chocolatine, er, pain au chocolat from Olivier Dessyn's Mille-Feuille was excellent. While the outdoor events were free, the Champagne & Chocolate Tasting and the Wine, Cheese, Cocktails, and Beer sampling required an entrance fee. Sunday, 12 July 2015, 12:00 Noon till 5:00 P.M.
Coffee on the Lower East Side? Whynot! Fabulous coffee and tantalizing croissants summoned my taste buds back to Whynot Coffee—this time to its Lower East Side outpost on Orchard Street. Unlike the '60s Parisian motif of the original, the theme of this site is that of an art gallery. To maximize exhibit space, the barista station is situated within an island in the center of the café. The spacious interior affords a fine setting in which to enjoy coffee and the art surrounding it. All the familiar delights from Blue Bottle coffee and Mille-Feuille bakery are here, too. Oh, and I discovered a new favorite: the raspberry croissant. Filled with a homemade raspberry preserve and dusted with dried raspberries, this bright, flaky pastry tasted of fruit, not sugar. I can't recall ever enjoying a more delectable croissant! The savory items were tasty as well. Both the prosciutto-and-provolone croissant and the smoked salmon quiche were satisfying, even though the latter was a bit overly farinaceous. Of course, the coffee was, as ever, superb. The gallery's inaugural exhibit—works by Brooklyn artist Jeremy Penn—was officially launched on Thursday, 12 December. It was a splendid evening of paintings, pastries, and prosecco. Have you been to the new café at the corner of Christopher and Gay Streets? Whynot? No, really, Whynot—that's the name of one of the newest arrivals on the Village coffee scene. Since it opened in May, this cozy little spot has developed quite a following. Wherefore has Whynot become so popular? Is it owing to the coffee or the café? A recent visit afforded a good occasion to find out. Whynot offers delicious baked items to accompany their java. The viennoiserie comes from Olivier Dessyn's Mille-Feuille bakery a few blocks away. Delivered frozen, the croissants are baked in the convection oven behind the counter. "It's the best way we could do it," explained Miki. "Before, we got the croissants already baked, but they weren't that fresh." My Pain au Chocolat (chocolate croissant), made with organic unenriched flour and hormone-free European-style butter, was warm, delicately flaky, and délicieux. (I'm saving the almond and raspberry croissants for future visits.) A delightful gluten-free macaron added a sweet finish to my morning coffee. Additional baked goods such as cookies and breads, many of which are gluten-free and vegan, come from LifeThyme Natural Market on Sixth Avenue. The space itself is as alluring as the coffee. Owner Emil Stefkov transformed an erstwhile women's clothing store into a seductive neo-retro European-style café. Wishing to create a setting evocative of 1960s French culture, he approached Brooklyn artist Jeremy Penn to produce paintings of some of the most popular icons of the day—Brigitte Bardot, along with Jane Birkin and Serge Gainsbourg. Penn's artwork infuses strokes of masterly sensuality into the happening vibe. A '70s-era Sansui stereo receiver (dare I call it a hi-fi? ), replete with a vintage Yamaha turntable, complements the retrospective paintings with groovy aural reminiscences. That's right, vinyl—no MP3s, CDs, 8-tracks, or even cassettes. (Simon & Garfunkel's Bridge Over Troubled Water was the LP of choice on my visit.) There's even a Discwasher kit with which to whisk the records! The music and the artwork combine to transport the mind to another place and time. "A lot of the customers reach a bigger creativity when they sit here," asserts Miki. Large windows on two sides add light and airiness to the 1,000-square-foot space, while providing a lens to the outside world. Outdoor benches augment the 40 indoor seats. "Some people see things as they are and ask why. I dream of things that never were and say Whynot." Comestiblab: In the south of France (from Poitiers down), the pain au chocolat is called a chocolatine. But ordering a chocolate croissant by that name in Paris is liable to be met with feigned ignorance and a derisive sneer. To Parisians, the word bespeaks a lack of sophistication—a trait they impute to southern French bumpkins. One of my favorite desserts this time of year is the bûche de Noël, or Yule log. As its name and shape suggest, this iconic French confection represents the European tradition of burning a large log in the hearth to celebrate Christmas and the winter solstice. Today, the name bûche is used, almost exclusively, to refer to the softer, comestible log. Essentially, a bûche de Noël (pronounced büsh dih noh·ELL, where ü refers to the German ü or the French u sound) is a génoise (or similar sponge cake) roll, filled with buttercream, and frosted to look like tree bark. Ends are often sliced off and fused to the top to resemble stubs of severed branches. Furthermore, meringue mushrooms are typically included as an edible decoration to the log. Many creative pasty chefs even insert diminutive plastic saws and axes to round out the arborcultural motif. As it has in various Yuletides past, our bûche came from Ceci-Cela this year. Known for its made-from-scratch délices, this NoLita pâtisserie française has long been a favorite of mine. Pastry chef Laurent Dupal, a native of Nancy, France, began his rise when he embarked on his study of baking at the age of 13. Classically trained at the prestigious Compagnons du Devoir du Tour de France, Dupal produces masterly pastries of all sorts. While a chocolate buttercream filling is traditional, I opted for Grand Marnier this time. Irrespective of flavor, two aspects of this dessert are critical to my delectation: restrained sweetness and spongy texture. When the foregoing elements are at their peak, my enjoyment is practically assured. Chef Dupal met both criteria in grand style to yield a bûche that delighted my senses with simple, fresh, and delicate flavors rolled into a beautiful and complex presentation. But why was the Grand Marnier frosting pink? While my Comestaccomplice enjoyed the Yule log without additional flavoring, I found that a drizzle of Grand Marnier added the perfect finishing touch. Of course, an accompanying glass of the liqueur was de rigueur. My month began with a fabulous foodist event in SoHo. On Sunday, 1 April, over 100 exhibitors strutted their stuff at the Culinary Expo and Book & Blog Festival, part of a five-day conference celebrating "The Fashion of Food" by the International Association of Culinary Professionals. The 2012 installment marked the 34th anniversary of the IACP conference. So much food and only four hours! Not wishing to resurrect ancient Roman rituals, I refrained from sampling everything (though I was tempted). Below are some of the highlights. The Wisconsin Milk Marketing Board offered several fine cheese samples as well as a Grilled Cheese Academy demo. Back in my SoHo days, it was called The French Culinary Institute. Since that time, the school has expanded and broadened its scope to become The International Culinary Center. Sampling their innovative Gazpacho evoked memories of dining at FCI's L'Ecole restaurant. This unusual preparation comprised Greek yogurt, grapes, cucumbers, almonds, white bread, pickled shrimp, smoked paprika, olive oil, and sherry vinegar. A few of the big names were on hand to demonstrate their wares. Cuisinart's new Griddler turned out some tasty Reubens. What more is there to say about this familiar name in the coffee world? Or is Runa's guayusa more your cup of tea? Made from a native Amazonian tree leaf, brewed guayusa packs more caffeine and twice the antioxidants of any other tea. Kikkoman, another well-known brand, earned its fame with soy sauce. Over the years, the company's product line has widened considerably. I particularly enjoyed the fiery Thai Style Chili Sauce. Strategically situated at the adjacent booth, Alaska Seafood served savory salmon sliders with Asian slaw that I spiced up with Kikkoman's Wasabi Sauce. This was one of the highlights of the festival. From Berkeley, California, Diane Lee's 7th Taste infused olive oils contain no extracts or artificial flavorings. Smooth and tasty! "The chef's in the jar" with these hand-harvested, artisanal salts from Chef Salt. Nueske's applewood-smoked meats were a pleasant discovery. With the recent addition of wild cherrywood-smoked bacon to their lineup, what's not to love? Don't forget the California veggies. Let there be no confusion with regard to the proper pronunciation of endive. "No, it's absolutely pronounced on-deev." I am not now, nor do I plan to ever be, a vegan. Nevertheless, these samples from Ella Nemcova's The Regal Vegan were quite alluring. Best of all, at 50 calories, a one-ounce serving of the delectable Faux Gras walnut-lentil pâté contains only three grams of fat. A guiltless pleasure! Faux Gras: A Toasted Walnut-Lentil Pâté. Pâté certainly pairs well with wine. While there was no Sauternes in sight, there were a few sippable vinos from Brooklyn Oenology. From fermented grapes to carbonated ginger. Fresh Ginger, Ginger Ale by Bruce Cost is a refreshing alternative to mainstream sodas. Unfiltered, and made with fresh ginger, this sparkling soft drink is as aptly named as it is delicious. Other flavors include Jasmine Green Tea, Pomegranate (with Hibiscus), and Passion Fruit (with Turmeric). Lucy's Whey offered several artisanal curds, including Capriole's Sofia (an ash-ripened chèvre), Consider Bardwell Farm's Pawlet, (a Vermont version of Toma), Vermont Creamery's Cremont (a cheese of blended goat's and cow's milk), and Jasper Hill Farm's Winnimere. I tried to save the sweets for last, but, sadly, I had reached my capacity before I could sample them. They certainly looked good! It was delightful to see a couple of familiar names and faces from the QEDC Entrepreneur Space. Comestiblog wishes to extend special thanks to the Wisconsin Milk Marketing Board. Pop quiz: Where can one find America's only gelato-on-a-stick? Pop answer: popbar in Manhattan's West Village. Combining innovation with the tradition of his native Italy, Reuben BenJehuda introduced the popular Florentine-inspired gelato concept to New York when he and Daniel Yaghoubi opened popbar in May, 2010. Their handcrafted frozen treats make a great summer refresher or a delicious dessert. I was invited to sample some recently. The display case affords a large, colorful selection of popbar's 26 rotating flavors. Not only are the pops attractive, fresh, and delicious, they're also kosher certified and made from natural ingredients only—no preservatives, gluten, artificial coloring, or artificial sweeteners are used. PopGelato and yogurtPop bars ($4.50) contain hormone-free milk; popSorbetti ($3.75) contain over 70 percent real fruit and no added sugar. Everything is made daily on the premises. With the assistance of a "Popologist" at the custom bar, one can choose "poppings" and "dippings" to design a personal "myPop." Poppings include chopped hazelnuts, almonds, and pistachios, as well as coconut shreds and chocolate sprinkles. Dippings comprise melted Belgian chocolate—dark, milk, and white—into which a pop may be immersed, half-dipped, drizzled, or double-dipped. For my tasting, I chose two popSorbetti and one popGelato. 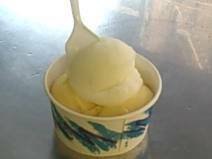 My first selection was lemon, the flavor by which I gauge all sorbetti and ices. Its frosty burst of citrus tang refreshed my palate without overwhelming it with unwelcome sweetness. This icy lemon pop was a bracing antidote to a hot summer's day. My second taste was of another fruit. 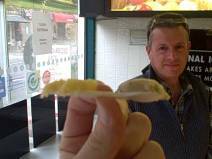 Much denser than the lemon, the mango popSorbetto had a mouthfeel similar to that of a frozen mango. Every bite seemed to be filled with pulp. Though its flavor and texture were true to the fruit, it was a bit sweeter than I'd normally like. I hadn't any idea I'd saved the best for last. My final sample was an exquisite pistachio popGelato, popped with chopped pistachios, and half-dipped with dark chocolate. Wow! The crunchiness of the nuts and chocolate combined harmoniously with the silkiness of the nutty gelato it enveloped. Best of all, it wasn't too sweet. It's hard to imagine a better frozen treat on a stick. May 14-15, 2011; 12:00 Noon till 5:00 P.M.
For more than 70 years, Essex Street Market has been a source of comestibles for Manhattan's Lower East Side. It was built in 1940 by Mayor Fiorello LaGuardia to move pushcarts and vendors indoors, off the teeming streets. Today, the market continues to house an eclectic mix of food purveyors within its historic walls. Some of my Essex Street Market favorites include chocolates from Shoppe Roni~Sue (a 2010 Comestiblog Valentine's Day pick), and cheeses from Saxelby Cheesemongers and Formaggio Essex. Sadly, I can no longer buy meats from a butcher shop that has operated here for four generations. Jeffrey Ruhalter, who represented the market's last remaining original vendor, closed Jeffrey's Meat Market recently. The fortunes and flavors of its vendors may have changed over the decades, but now Essex Street Market itself is in jeopardy. In her blog, The Saxelby Almanac, Anne Saxelby reports that redevelopment plans call for the possibility of razing the historic building and moving the vendors elsewhere. Can we afford to lose another Lower East Side icon? As a food writer, I often receive requests to mention some product or event on my blog. Happily, I'm able to manage most such solicitations with the single click of a mouse. Occasionally, however, I find something very appealing in my electronic mailbox. For instance, a recent invitation to a soirée that included gourmet food, artisanal beer, and a membership to a unique dining club, was a food blogging perquisite I couldn't resist. Let's kick off our dining exploration with a review of the evening's comestibles, beer, and tequila. Tequila? ¡Sí! Our tasting commenced with a raw bar, comprising Malpaques and Blue Points (from the nearby Sea Breeze Fish Market), paired with a sample of Patrón Silver and a subsequent taste of the triple-distilled, slightly aged Gran Patrón Platinum. (Were you aware that a co-founder of Paul Mitchell Systems—John Paul DeJoria—was also one of the founders of The Patrón Spirits Company?) Produced from 100% Weber blue agave, both tequilas are smooth and sweet, and have a peppery finish. With oysters, they're a potent alternative to Chablis, and a marvelous way to start an evening! Deep-fried oysters followed the raw variety. The spicy-hot Screaming Oysters from Hell is one of Albert Hall Tavern's signature appetizers. Executive chef Bill Seleno kindles an insidious fire with Sambal Oelek, and presents his infernal [s]hellfish atop slices of sweet pineapple to produce an underworldly flavor sensation. If this is hell, I'm liable to commit many additional sins. The mollusks were paired with Stone Pale Ale, Stone Brewing Company's "Southern California interpretation of the classic British pale ale style." Light and hoppy, this ale kept the oysters' flames under control. It was back to raw for our next course, Tuna Tartare with Quail Egg. Though perhaps a bit salty, this dish was absolutely delicious. (I should admit, however, to being very partial to tuna.) It was accompanied by Estrella Galicia, a somewhat light lager, considered by some to be northern Spain's equivalent of Coors. Regardless of comparisons with Rocky Mountain brews, it goes great with fish. Next, the Deviled Braised Short Rib with Horseradish and Mustard Seed added some meat to the menu. Served on toast, its tangy and spicy flavors were enhanced by the sweetness of Brouwerij Bosteels's Tripel Karmeliet, a three-grain (wheat, oats, and barley) Belgian beer, brewed using a 17th-century recipe. Gentle on the palate, it adds body to any dish it accompanies. We returned to the sea for our next course. To be honest, the Pickled Sardines with Fennel Pollen Meyer Lemon Cream was my least favorite dish of the evening. I'm not fond of fennel, and I didn't find these sardines particularly compelling. Overall, this sample from the bar menu wasn't bad, but I'd probably not order it on a future visit. Nevertheless, Gaffel Kölsch from Cologne, Germany was the perfect foil for this preparation. The Becker Brothers brew is rich, somewhat light, yet slightly bitter at the same time. It's another fine beer to pair with fish. Our salad arrived next. I could readily taste the garlic in the Grilled Radicchio with Trifoline Cheese and Butternut Squash Carpaccio. Chef Seleno's combination of the foregoing elements yielded a harmonious mix of flavors. The sweetness of the butternut squash partnered well with that of La Brasserie de St-Sylvestre's Gavroche French Red Ale. The fruity sweetness of this Bière sur Lie (beer on its lees) comes from a special top-fermenting yeast that produces a re-fermentation in the bottle. I should like to introduce the next course by mentioning that I typically have little inclination to order mussels. But oh, those garlic aromas wafting from Chef Seleno's Steamed Mussels with Charred Rosemary and Black Garlic! Perhaps owing to the dominance of the fermented (black) garlic, I found these mollusks to be exceptionally flavorful. (I made good use of the crusty bread to finish whatever broth remained.) Appropriately, they were paired with a German Pilsner that did not attempt to make any powerful statements. Radeberger, a highly effervescent pale golden lager with a hoppy bitterness, is a very good palate cleanser that could also serve as a fine companion to German Würste. Our final course, Roasted Suckling Pig with Maple Rum, was the evening's pièce de résistance. It was tender, succulent, and flavorful—everything I'd expect from a suckling pig. Any initial concerns over the sweetness of the maple rum were dispelled with my first bite. As delicious as it was, however, I found that just the lightest sprinkle of salt added the perfect finishing touch. What beer to serve with such an exquisite dish? Something with strong flavors of hops? Should it be sweet or dry? The answers appeared in a bottle of Hop Rod Rye from California's Bear Republic. This hoppy Healdsburg IPA is brewed with 18% rye malt to give it a dry spiciness that is delicious with or without food. What a marvelous beer with which to finish! Have a Foodie Holiday is the theme of this year's windows at Barneys New York on Madison Avenue. Wijnanda Deroo's fascinating photographic exhibit Inside New York Eateries opened last week at Robert Mann Gallery in Chelsea. With subjects ranging from plebeian to plush, her images offer a diverse exploration of notable Gotham restaurant interiors past and present. Except for murals and other decorations, Deroo's photographs contain no human figures, thus allowing the viewer to focus on architecture and furnishings rather than on food and dining. Moreover, this absence of people creates a unifying tension to her collective work. Many of the photographs evoke personal memories that span decades. Who hasn't been to Yonah Schimmel's Knishery, or Lexington Candy Shop? Or to The Russian Tea Room, 21, Grand Central Oyster Bar, and The Four Seasons? I still recall pleasant luncheons at Jerry's erstwhile SoHo location, and delightful meals in the spectacular setting of the now-defunct Tavern on the Green. 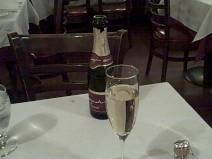 I also remember romantic dinners at Café des Artistes that were followed by a horse-drawn carriage ride through the park. My oldest recollection, however, is of the dingy Nom Wah Tea Parlor, an extant Chinatown fixture that looks just as it did half a century ago. Finally, though I've never been to Lederhosen, Deroo's image—a corner table by a kitschy mural of Schloss Neuschwanstein amid the Bavarian countryside—has piqued my curiosity. Hours: Tuesday - Saturday, 11:00 A.M. till 6:00 P.M.
Owing to my dislike of fast food and to my usual hurried pace when I'm in the Herald Square area, I seldom dine in this part of Manhattan. All that has changed, however, with the recent opening of Leña, a pan-Latin grill that caters to budget-minded gourmets on the go. 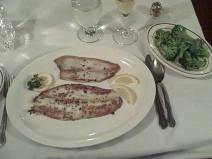 Their fresh, seasonal, and delicious meals are prepared to order and served quickly. For those who don't know that Leña (pronounced LEHN·yuh) means "firewood" in Spanish, a rack of logs along the top of the dining room wall should provide a good indication of the restaurant's preferred method of cooking. Should that not suffice, however, a window to the wood-burning grill in the back ought to eliminate any doubt. Having spent a dozen years working with the likes of Mario Batali, Eric Ripert, Jonathan Waxman, and Andre Balazs, Leña's executive chef-owner Ronny Abenhaim is no stranger to haute cuisine. 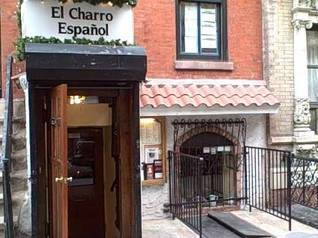 Noting the ubiquity of Mexican eateries in New York, he sought to offer an alternative that showcases flavors from a broader range of Latin American kitchens. As popular examples, Ronny cites chimichurri (from Argentina) and his signature coconut rice (from the coastal region of his native Colombia). Intended to suit busy schedules, his menu features wraps, salads, and plates that are designed to please discriminating palates. Diners select one of four proteins—chicken, steak, fish, or tofu—to be combined with a choice of sauce, additions, or sides. Ronny is fond of noting that one can dine at Leña for a month without having the same meal twice. On a recent luncheon, I ordered the Grilled Chicken Plate ($9.50) with an addition of the aforementioned coconut rice, and a side of tostones. Overnight brining and subsequent wood-grilling result in a flavorful bird that delivers the right degree of smokiness. It's hard to imagine a better partner to the savory chicken than the perfectly cooked coconut rice. Every forkful of its subtle sweetness tastes almost like a dessert with the main course. I was never fond of tostones until I tried the ones here. Ronny prepares them by slicing green (unripe) plantains, then frying, smashing, and soaking them in a saline-garlic solution, and finally frying them again to make them crispy. They're great with pico de gallo, and even better with mojo (pronounced MO·ho), an oil infused with roasted garlic cloves and chili flakes. Yuca (or cassava) fries are another staple in Latin American cooking. Their mild flavor and starchy texture make them a sine qua non among South Americans. Conceivably, one could order them with the beef option to yield a Leñan variation of steak frites. The Grilled Chicken Salad ($7.95) consisted of sliced chicken over lettuce, topped with pico de gallo. Though my Comestaccomplice asked about adding guacamole, Ronny suggested she try queso fresco (a crumbly "fresh" cow's milk cheese) instead. He described its slightly acidic flavor as being similar to, but milder than that of feta. The upshot: my dining partner will not order that salad again without it! While the chicken remains my favorite, the steak and fish are delicious as well. The marinated tofu affords a good vegetarian option, but does not reflect my first choice. Selecting the right sauce(s) to accompany the protein is, of course, a matter of taste. Nevertheless, certain pairings are particularly successful. To wit, chimichurri (a mixture of cilantro, parsley, garlic, chili flakes, olive oil, and rice vinegar) goes especially well with skirt steak, and brown butter partners very nicely with tilapia. Although pico de gallo is considered de rigueur with chicken, I prefer Leña's smoky chili pepper sauce—a fiery blend of charred peppers and tomatoes—to accompany my pollo. The pickled onions, also considered to be a sauce, are excellent as well. On a future visit, I'd like to try the smoky domestic blue cheese dressing with my steak. The fresh-squeezed juices are delicious and thirst-quenching. We'd requested the least sweet, and while lemonade fit the bill, we weren't so sure about the passion fruit. But once again, it was a winner. Its rich taste affords hints of sweetness initially, but delivers a refreshingly tart and slightly earthy finish. Like the passion fruit, the tamarind is pleasingly tart as well. Its wealth of antioxidants and other healthful properties—such as those that promote cardiac and digestive wellness—make it a top choice. To finish on a sweet note, a confection that has many variants in the Americas: alfajor (pronounced ull·fuh·HORR). Based on the Argentinean variety, Leña's is a cookie sandwich in which two biscuits are joined together by a dulce de leche center, and coated with coconut flakes along the edge. With the sweetness of a fig, it's pleasant without being cloying. It's a sweet way to end any meal. Leña provides a new, fresh option for breakfast and lunch in the Herald Square area. The crowds say it all: offer people a delicious variety of fresh and wholesome food at bargain prices, serve it in a friendly and speedy manner, and customers will beat a path to your door. Open Monday through Saturday, 7:00 A.M. till 5:00 P.M. While experimenting with a new restaurant can have its risks, dining at the new Pyramida Grill is a pretty safe bet. To be accurate, this Mediterranean Upper East Sider is new in location and scale only. Co-owners and chefs Matthew Koven and Roger Ramkissoon wanted to "do something big" when, less than three months ago, they moved from their small take-out spot on 78th Street into a spacious, full-service restaurant at the corner of 73rd and Second Avenue. Their new digs are inviting, as are the food, the service, and the prices. Sticklers for quality, Matt and Roger pride themselves on using fresh, homemade ingredients only. Their menu is the same for lunch and dinner and offers healthful items that suit appetites both large and small. It features a wide array of starters, sandwiches, wraps, salads, and mains, as well as a number of vegetarian plates. (A weekend brunch menu was introduced recently.) Nothing I tried disappointed. In addition to familiar appetizers such as Hummus, Babaganoush, Tabouli, and Tzatziki, Pyramida tempted me with some unique diversions. Pumpkin Gloria, for example, is a very popular starter made from calabaza, a type of sweet squash often called West Indian pumpkin. Named for Roger's mother (the recipe's originator), the dish is seasoned with onion, garlic, and cumin—no additional sweetener is used. Though available throughout the year, it seems custom-made for autumn. Some of my other favorite starters include Baigan & Aloo (sautéed eggplant and potato), Sweet Pea Purée, and Curry Cabbage Salad with pistachio and pine nuts. I've saved one of the best for last, however. The New York Times described Pyramida's as "first-rate falafel." The spherical deep-fried ground chickpeas—seasoned with garlic, cumin, and pepper—are extremely good indeed. It seems The Gray Lady got it right. The majority of starters and sides are priced $5.95 for a small portion; $8.50 for a medium one. Should a single appetizer not suffice, any three salads or spreads may be combined to create a custom Appetizer Sampler for $11.95. Most of the main courses are priced under $20. 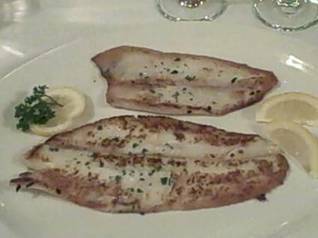 Though I tend to prefer fish, I find Pyramida's meat plates irresistible. Subtle yet flavorful, the dishes don't require aggressive seasoning to taste good. For instance, a major factor in the delectability of both the chicken and lamb Shish Kebab ($17.95 and $18.95, respectively) is that their spices aren't allowed to overwhelm the natural flavors of the meat. The same is true of the Kofta ($17.95), a tasty minced beef preparation. If I had to single out a favorite, however, it would be the exquisite Lamb Gyro ($16.95). Succulent, well-prepared, and, yes, perfectly seasoned, this dish is simply delish! But for those unable to settle on one particular meat, I'd recommend the Ultimate Meat Combo ($19.95). Should it be necessary to "fire up your food," there's Roger's Homemade Hot Sauce—a mixture of Scotch bonnet (a relative of the habanero), garlic, lemons, carrots, pumpkin, and salt. 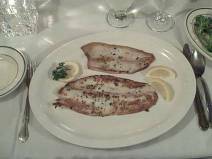 (The use of lemon is a welcome departure from the vinegar often found in other piquant sauces.) "Tell us how hot you want it … on a scale of 1 to 10. 10 being burn your face." While Roger's sauce may be quite hot and peppery, my visage managed to escape immolation. There are very good side dishes as well. For example, Pyramida's version of Peas & Carrots spices up an old workhorse with delicious results. Furthermore, I found Matt and Roger's preparations of Lentil and Saffron Rice to be perfect. With Pyramida's beer-and-wine license just days away, I tried their famous Freshly Squeezed Lemonade ($4.50). Zesty, frothy, refreshing, and not too sweet, it's no wonder New York Magazine named it "NY's best lemonade" three years in a row. The recipe is simple: fresh-squeezed lemons, a little sugar, and water. This is how lemonade should taste. I'm not sure whether I'd saved enough room for dessert, but I indulged anyway. Everything except the ice cream here is homemade. With two types of baklava ($6.95 each), it was hard to choose. Both the Classic (almonds and walnuts) and the Cashewlava (cashews only) delivered a satisfying finish without being overly sweet. It may seem odd, but the latter's flavors reminded me of a baked brie. Baked to order and served hot, the Outrageous Warm Chocolate Truffles ($8.95) are an encapsulation of a cacao lover's dream. "No fork! And don't squeeze too hard," insists Roger as he instructs me to use my fingers to roll each truffle in confectioner's sugar and then pop it into my mouth, whole. My gentlest bite released a veritable chocolate explosion! These truffles are what is meant by a melt-in-your-mouth dessert. Though Pyramida's tasty homemade dishes are still available for take-out and (free) delivery, their expansion into a full-service restaurant is a welcome addition. Matt and Roger's commitment to freshness and quality are evident in everything they prepare. And with a grade of A from the New York City Department of Health, the new Pyramida is a pretty safe bet indeed. The 17th annual Taste of Times Square takes place today from 5:00 P.M. to 8:30 P.M. on West 46th Street (between Broadway and Ninth Avenue) and on Broadway (between 45th and 47th Streets). Over 50 area restaurants offer tastes of their signature dishes representing cuisines from around the globe. Tickets may be purchased at $1 each and redeemed at the tasting tables. Please visit the Times Square Alliance website for more details. A shop that sells nothing but fries? Why not? After all, french fried potatoes are among the most prominent staples of the American diet. A little background before we taste, however. Despite congressional notions to the contrary, the misnomered fries are not of French provenance. Pommes frites (pronounced POHM·FREET; essentially, "fried potatoes"), or simply frites, are widely believed to have originated in Huy, a municipality within Belgium's Francophone Walloon region, in the province of Liège. To substantiate that belief, Belgian historian Jo Gérard cites a document that traces the area's practice of frying sliced potatoes back to the late-17th century. The 1781 family manuscript relates that, for more than a century, the poor inhabitants of the Andenne district (which includes Huy) "allegedly had the custom of accompanying their meals with small fried fish, but when the [Meuse] river was frozen and they were unable to fish, they cut potatoes lengthwise and fried them in oil to accompany their meals." Unfortunately, we've grown accustomed to engineered adaptations of the original Belgian fries by commercial producers seeking to capture that market. While it may not be shocking to discover that fast-food and so-called family restaurants use frozen spuds, I was surprised to learn that celebrated chef Thomas Keller serves Sysco Systems frites at Bouchon. "The manufacturing process used on Sysco Brand French Fries involves both water and oil blanching to assure uniform golden color, plus air drying to assure high potato solid content and a crisp outer shell, which extends holding time." Do we still know how a simple fry tastes? Happily, Pommes Frites in Manhattan's East Village offers us a reminder with the pure, earthy flavor of its authentic Belgian fries. Here, hand-cut potatoes are fried twice: once to cook them through; and again to add color and texture. The resulting golden-brown beauties are simultaneously crisp and silky. Their thickness, incidentally, distinguishes Belgian pommes frites from the thinner variants known as pommes allumettes ("matchstick potatoes"), whose dimensions are similar to those of McDonald's fries. Pommes Frites offers three serving sizes: regular ($4.50); large ($6.25); and double ($7.75). Accompaniments include several condiments at no extra charge, as well as 25 sauces at $1 each. I chose a componential variation of the especial: a cup of ketchup mixed with raw onion, and another of frites sauce (traditional European mayo). In the end, however, the sauces tasted better together than they did separately. Please click on the image above for a larger view of the menu. Comestiblab: They're not fried apples. When referring to potatoes, pommes (literally, "apples") is a shortened form of pommes de terre ("apples of the earth," or "earth apples"). Terre comes from terra, the Latin word for earth. (Many English words—such as terrene, terrain, terrace, and terrestrial—share this etymological origin.) The word frites is the past participle of frire ("to fry"). While "pommes frites" is easier to say than "pommes de terre frites," it's easier yet to say "frites." Of course, it's not all that hard to say "fries," either. To celebrate its millionth post, Foodbuzz threw a bash fit for a millionaire on Tuesday, 12 May 2009, at davidburke townhouse on Manhattan's East Side. Even this old fresser was not prepared for the unending barrage of delights with which I was besieged. Never has my appetite been so helplessly overpowered. If David Burke, one of this year's inductees into the James Beard Foundation's Who’s Who of Food and Beverage in America and 2009 chef/innovator honoree by the Nation's Restaurant News MenuMasters was out to impress a bunch of foodists, he surely succeeded. Chef Sylvain Delpique's variety of gustatory masterpieces—highlighted by mouthwatering hors d'œuvre—provided a culinary version of Plato's Retreat. Needless to say, it was a marvelous evening of merrymaking with my fellow food bloggers. Thanks a million, Foodbuzz! Medium-rare: Just the way I like it! Prime rib of beef au jus—need I say more? For the time being, wistful diners who pass 255 Smith Street, Brooklyn will have to adapt to the patois of Little Italy to enjoy some of their Gallic favorites. In January, Patois, a 1997 pioneer of Smith Street's restaurant row, closed its doors with the promise of reopening across the street in the near future. Last Wednesday, meanwhile, the Mulberry Street incarnation made its debut. Although the new digs are brighter and cleaner than the recently abandoned ones in Carroll Gardens, they somehow lack that je ne sais quoi. Nevertheless, "the food is the same," I'm reassured. Incidentally, Patois' prix fixe menu ($9.95 from 11:30 A.M. till 4:00 P.M.; $19.95 after that) represents an extraordinary value. The future of the Manhattan location is uncertain, however. Will the new Patois will continue to operate should indeed the newer one open at 254 Smith Street? Stay tuned. But in the meantime, bon appétit! On Thursday, 26 March, sample signature dishes from the World Financial Center's eclectic array of restaurants for $1 to $5. Choices range "from mini-burgers and pork dumplings to silky gelato and crème brûlée." Sounds good. Toward a verdant goal, Brookfield Properties, the event's sponsor, will use biodegradable or compostable trays and flatware. Thursday, 26 March 2009, 11:00 A.M. to 2:30 P.M.
Because it had been a while since my last visit to Curry Row in the East Village, I hadn't kept apace with the restaurant situation there. As we all know, times are tough. Nowhere is the flagging economy more evident than in the mostly empty Indian eateries on East 6th Street. We were surprised to find that, contrary to its takeout menu's stated hours, Angon was open on a Monday. I wasn't certain whether I'd eaten there previously, but decided to give it a (possibly second) try. 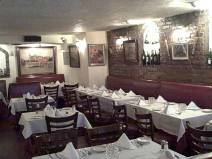 As with many restaurants on this block, Angon's dining room is a few steps down from street-level. The "Indian Culinary Den" is attractive, tasteful, and comfortable. We were welcomed warmly and enthusiastically. Our server was solicitous, without being intrusive—a task facilitated by our being the only guests. I admit to being a sucker for sampler platters—especially when feeling particularly indecisive or unfamiliar with a restaurant's strengths (and weaknesses). Maybe it was a combination thereof that led us to order the ultimate dinner-for-the-irresolute. To begin, we selected the Assorted Appetizers ($10.95), a small sampling—e.g., samosa, pakora, and such—of their popular starters. Unfortunately, the plate was overwhelmed by deep-fried, shredded vegetables, to conceal, perhaps, the dearth of more substantial items. Were the appetizers tasty? Yes, albeit each was a bit dry. We were off to an adequate start. The Garlic Nan ($3.50) sounded too interesting to pass up. It was not quite garlicky enough for my tastes, but I found it preferable to plain Nan. For the main course, we split the Mixed Grill Combo Platter ($19.95), a representative selection of Angon's tandoori specialities. (It's well-suited for sharing by two.) The Chicken Tandoori samples were nicely seasoned, but alas, slightly overcooked. On the other hand, the Fish Tikka (salmon) and the Kababs were moist, tender, and tasty. The second course was quite an improvement over the starter. In sum, the sampler platters afforded a good overview of Angon's offerings. Having favored the salmon, I'd like to pursue that as an option on my next visit. One week ago, on 13 October, Foodbuzz, Inc. officially inaugurated its food blogger community. Amid all the buzz, featured publishers from New York and New Jersey were invited to attend a dinner in their honor at Spice Market this past Saturday. What a perfect opportunity to indulge in two of my favorite pleasures: talking about food and, better yet, consuming it. Jean-Georges Vongerichten's interpretation of Asian street foods brings together the flavors Vietnam, Thailand, and China. Dishes are served family-style to allow sharing. Everything I tasted ranged from very good to excellent. The red curried duck was a standout. Special thanks to Foodbuzz's Ryan Stern and Devon O'Donnell, who flew in from San Francisco, and to Stacey Caron (Stacey Snacks) for organizing this spicy soirée. Greetings also to my fellow foodbuzzers who made the evening so enjoyable. On most Monday evenings, one could find my late wife and me seated at table A1—in the corner, by the window—at Mr. Tang's in Bay Ridge, Brooklyn. We had been regulars at the Chinese mainstay on Third Avenue long before the emergence of the Chinatown in nearby Sunset Park. As the foregoing community grew, it siphoned away many of the old customers. Nevertheless, our loyalties remained steadfastly with Mr. Tang. We had found a good thing, and we stuck with it. Having tried a number of items on the menu over the years, we refined our selection to the point at which we'd simply order "the usual." Our preferences were well-known and required no explanation—favorite munchies and condiments arrived automatically, as did our drinks and dishes. On the Ides of March last year, however, all that came to an end. New building ownership and the ensuing rent hike led to the dining room's shuttering, leaving behind only the take-out fragment of this once large and bustling Bay Ridge institution. Fortunately, Mr. Tang had opened a branch in Manhattan's "Old Chinatown" several years earlier. Initially, the restaurant de-emphasized the Mr. Tang brand in favor of its address: 50 Mott Street. Over time, however, the name evolved to Mr. Tang of Mott Street, its present designation. It's nearly impossible to recapture the enchantment of our Monday evenings in Bay Ridge—the present dining room is less cozy; the longtime, familiar staff is absent; and alcoholic beverages are limited to beer and wine. Though my Zombie (a potent concoction of various rums and fruit juices) is no longer available, I can still enjoy, mirabile dictu, "the usual." The meal begins with Mustard Green Soup with pork and tofu ($8.95 for two). The server always remembers to ask the kitchen to add extra scallions, garlic, and ginger. It's a very tasty and healthful soup. Interestingly, it was introduced to us during an early visit to Mott Street, when my wife was under the weather. Our waiter recommended the soup as being restorative and easily digested. We enjoyed it so much that we incorporated it into our Monday menu in Brooklyn. On a recent visit, I was presented with a sample of the House soup—a broth with slivers of beef and a slice of lotus root. The lotus added an unmistakable hint of sweetness. It's not bad, but not compelling enough to displace the Mustard Green soup. The soup is followed by Chinese Spinach with Minced Garlic ($7.95). The infusion of garlic complements the vegetable's flavors perfectly. This dish is best enjoyed over rice, which absorbs the juices of the garlicky spinach nicely. And then comes the pièce de résistance: Crispy Fried Chicken, Cantonese style ($10.95 half; $21.90 whole). I have a passion for exceptional fried chicken. Sure, there's Charles Gabriel's delicious Southern-style, or Forte Baden Baden's and Bon Chon's tong dak. But when Mr. Tang gets it right, there's none better. Served (upon request) with jiao yen (literally, "spiced salt," a blend of salt and Sichuan pepper) and a garlic-ginger dipping oil, the moist, golden-brown, crispy-skinned bird is a taste of fried chicken nirvana. Chicken prepared in this fashion is rare outside Chinatown. Our "usual" was enough to sate the two of us. The meal typically concluded with both almond and fortune cookies, as well as orange wedges. On my most recent visit, Mr. Tang added a nice touch: a slice of moon cake to celebrate the Mid-Autumn, or Moon, Festival. While Mr. Tang of Mott Street can never equal the memories of Monday evenings in Bay Ridge, I'm delighted that it's a place where I can still savor my old favorites. Casual, homey, and family-friendly, Bubby's Pie Company has been serving comfort food in TriBeCa for nearly two decades. It's a reliable neighborhood spot for breakfast, lunch, brunch, late-afternoon collations, and dinner. The place mats, laden with food-trivia, make good conversation boosters and provide stimulating fodder for cocktail party persiflage. I've always considered the fare to be good, but unexceptional. A recent dinner changed my mind, however. The atmosphere was still as welcoming as ever, but the food was better than I remembered it to be. In an attempt to cling to the last vestiges of warm weather, I started the meal with a better-than-average chilled gazpacho ($6 a cup; $8 a bowl). It was fresh, chunky, and just spicy enough. The homemade rolls provided a good accompaniment to the soup. As my main course, I chose the salmon special, encrusted in pink and green peppercorns, with white wine and lemon butter ($24). The moist and tender fish was expertly prepared with spices that enhanced its flavor without overwhelming or masking it. 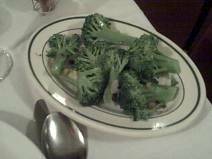 Many restaurants of this genre tend to massacre their vegetables. Not so here, however, with the fresh, grilled asparagus and rice pilaf that filled the rest of the plate. One aspect of the dinner that was not so well crafted as on previous visits was the Margarita. I had once considered it to be one of the area's best, but on this occasion, the bartender's sparing use of tequila rendered it merely average. A more significant complaint, however, concerns the service. It was friendly enough, but the timing was inept. 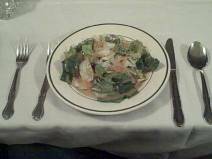 To wit, I endured a lengthy wait for my soup, yet I had barely started my starter when the main course arrived. It should have been abundantly obvious that I was far from ready to receive my next course. Nevertheless, there it was—served to me with utter nonchalance and without apology. Regrettably, I had to send it back to the kitchen. To make matters worse, my drink was served long after it had been ordered. During extraordinarily busy times, one might excuse this, but with the dining room not, in fact, particularly crowded, such a lapse seemed inexcusable. It's ironic that I've dined at Bubby's Pie Company many times since its opening in 1990, yet I can't remember trying their tantalizing pies. Flaunt your pie-baking prowess or sample that of others at Bubby's fifth annual Brooklyn Pie Social, this Sunday, 28 September, 2008, from 12:00 Noon to 3:00 P.M., 1 Main Street, DUMBO, Brooklyn. Many of us drink Oolong tea (a variety of which is typically served in Chinese restaurants) more for its health benefits than for its taste. Let's face it, some of these teas are banal at best. Fortunately, not all are created equal. About this time every year, Ten Ren—a worldwide purveyor of fine Chinese teas—offers its special Spring Tea, a selection of premium Green Oolong from the year's spring harvest. Tea connoisseurs anticipate the arrival of these "high mountain" teas with a level of enthusiasm comparable to that of oenophiles awaiting the release of a coveted vintage. Oolong leaves harvested in winter and spring are superior to those gathered during other times of the year. The fresh, floral aromas enhance the rich, smooth flavors enjoyed with every sip. Rather than leaving a bitter aftertaste (as is often the case with green teas), Spring Tea imparts a pleasant, subtly sweet finish. Once a year, I treat myself to some of this exceptional tea. Ten Ren offers samples readily; the 2008 vintage tastes might-tea fine. My budget directed me from the "number one" tea ($170 a pound) to the "number three" tea (a mere $35 a pound). (It wasn't clear what happened to the selection in between.) Regardless of price, it is among the finest Chinese teas I've tasted. Here's to Spring! It was a place we saw every day. The corridors within its concourse were no less familiar than the blocks of our own neighborhood in Brooklyn. My office was across the street; my late wife's was a few blocks away. We not only worked in the area, we played there as well. Lower Manhattan was our "other neighborhood." To those of us whose daily activities were interwoven with the World Trade Center, the anniversary of the 9/11 terrorist attacks is particularly poignant. Please allow me to share one personal aspect of it with you. After years of fine-tuning, our schedules had begun to run like clockwork. As with the World Trade Center itself, we took for granted the various elements of our daily routines. Every weekday morning, for roughly a decade, my wife and I ate breakfast at Essex World Coffee Shop on Liberty Street, opposite the southeast entrance to the World Trade Center. 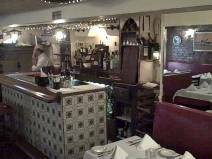 During that time, we had grown fond of the restaurant, its owners, and its staff. Brothers Johnny and Jimmy Costalas, co-owners of Essex World, greeted us warmly every morning and made certain everything was all right. Jimmy's son, Steve, was an ever-friendly presence as well. During the hockey season, nary a day went by without some sort of discussion of the Rangers. His energetic cheerfulness helped brighten our mornings. Eventually, Steve left Essex World to take over the operation of Trinity Deli, one of the family's other businesses, around the corner. The Costalases employed a loyal staff whom they treated like family members. Benny (recently deceased, upon whose customary salutation, "Good morning, Governor," I'd come to depend), along with Elio, and Mohammed, typically manned the back counter. Since our breakfast orders seldom varied, they were issued tacitly after a while. A simple nod or wave as I approached was enough to invoke the familiar call to the grill: "Let me get a fried egg on whole wheat, down, two times to stay!" It may sound silly, but the convenience of not having to ponder a breakfast menu relieved some of the stress at the start of the day. And, of course, there were the other regular customers. Though we didn't know most of them by name, we knew them by their habits and mannerisms. There was little interaction with our fellow breakfasters, but their faces and idiosyncrasies were reassuringly familiar somehow. In 1997, Essex World was closed several months for renovation and reopened as The Food Exchange. The new interior had a softer décor and a homier ambiance than the industrial, fast-food atmosphere that preceded it. Fixed tables and hard bench seats gave way to more comfortable, movable furniture. The gussying up didn't end there—the guys behind the counter now sported dress shirts and ties! The redecoration was welcome, but, more important, our breakfast place was back. No matter what sort of day lay ahead, this was always our reliable jump-start. Then, on that clear, crisp, sunny morning of September 11, 2001, all that came crashing to a halt. The widespread devastation that resulted from the terrorist attacks left us wondering whether our friends at The Food Exchange had survived. Several months later, my wife's chance meeting with Johnny on the street (as he was helping his staff find work in the area) allayed our fears. Everyone had escaped safely. "Someone was looking out for us that day," recalls Vivia Costalas Amalfitano, Steve's sister. Those who remember the traffic patterns around the World Trade Center would strain to recall the presence of tractor-trailers on Liberty Street. On that fateful day, however, after the first tower had been hit, one had stopped directly in front of the restaurant. Despite Johnny's entreaties to move it, the driver simply deserted his truck right there. It was a fortunate happenstance, as things turned out. When the debris began to fall, Johnny pulled down the steel security gate at the front entrance. The abandoned truck absorbed much of the impact and the closed gate further reduced the effects of the towers' ultimate collapse, thus allowing everyone to escape safely through the back onto Cedar Street. Sadly, many of the regular customers who were at work in the towers weren't so fortunate. Vivia describes the area around Ground Zero following 9/11 as, "surreal, like a scene out of a movie." "Debris was at the foot of the [Liberty Plaza] Park. And the smell was horrific." Returning there required presenting exhaustive documentation—passport, driver's license, lease, etc.—at several checkpoints, from Canal Street southward. For roughly a month and a half, the space inside Food Exchange was used for triage. During that time, Johnny was there helping out every day. Several weeks after my wife's fortuitous meeting, it was my turn. Johnny spotted me on a subway platform, charged over, and threw his arms around me. Amid our joyous reunion, I asked whether he had plans to reopen. His response came with the sad resignation that, since he was well into his 60s, it was probably too late for him to start over. But fortunately, the story doesn't end there. Fast-forward to October, 2003. Clearly, the tough had got going. After the ashes and rubble had been cleared, a new Essex World Café emerged under the new corporate name, Survivors, Inc. "I had to do it for Uncle Johnny," explains Vivia. Over the course of the four decades leading up to 9/11, her uncle and her father had overseen every iteration of Essex World—11 in all, beginning with the original Essex Coffee Shop at 7 Dey Street. Most of the familiar faces behind the counter had returned as well. For some, however, the memories of 9/11 were too devastating. Vivia's brother, Steve, left for Colorado in November, 2001; he returned home to New York just two months ago. Ground Zero continues to draw a large number of visitors. "How many tourists really get it?" muses Vivia. "This was our neighborhood. I did everything down here but food shop." "This was my focal point," adds Steve, who reminisces about doing all his Christmas shopping in the World Trade Center concourse. And so it was for me and my late wife. This was a neighborhood to us as well. The World Trade Center comprised a large part of our daily mosaic. It was a place we knew intimately. Occasionally, my mind's eye still takes me on a virtual tour of the concourse. Though my life has been altered irrevocably by the terrorist attacks, I often find comfort in revisiting places that hold memories of the halcyon days preceding 9/11. Essex World represents such a place to me. And despite the trauma suffered by the Costalases and their staff—or perhaps in spite of it—the restaurant salutes those more innocent times with their take-out menu. On it appears the skyline—our neighborhood—towers intact. Sadly, the fortitude and determination to repair and reopen is often untold, and taken for granted. The Costalases represent some of the unsung heroes of 9/11. For more information, as well as additional accounts by members of the Essex World family, please visit the Tribute WTC Visitor Center at 120 Liberty Street. How about some refreshing iced tea on a hot day? If you're in SoHo, consider stopping by Sanctuary T to celebrate their first annual Iced Tea Festival. From now through 10 June, you can sample up to five of their daily blends gratis. Beyond the five ready-made selections, Sanctuary T offers a dizzying selection of over 70 whole-leaf loose teas and flowering-art teas to be enjoyed in the restaurant or at home. My favorites were the Blackberry Lemonade, Pineapple Rooibos, and Peppermint Moon. Drink up! Last Wednesday at Chase Plaza, the Downtown Alliance held its tenth annual Dine Around Downtown™, a gathering of 50 eateries from Lower Manhattan. These ranged from the old standbys like bar food from Jim Brady's to extravagant venues such as Bouley. For $3 to $6, one could sample one of a restaurant's signature menu items and enjoy it in true Wall Street fashion—standing or walking about. The selections come with the territory. How does Danube's Salmon in Watercress Sauce sound? Perhaps you'd prefer Harry's Oysters on the Half Shell or Smörgås Chef's Aquavit-cured Gravlax. Or do you favor Ancora Ristorante’s Kobe Beef Ravioli or Stone Street Tavern's Lobster Mac and Cheese? The list went on and on. Me, I favored them all, but alas, so much food, so little capacity. My instincts led me to the longest lines. I decided to try Delmonico's Steak Sandwich first. The $6 price seemed reasonable for a deliciously simple combo of tender beef on a fresh hero roll. The meat was seasoned sufficiently to obviate the need for additional salt or pepper. I was still hungry, however. After all the recent press reports, I couldn't resist sauntering over to the adjacent booth to try Wall Street Burger Shoppe's Char-grilled Angus Beef Cheeseburger. The delicious $4 sample seemed like a relative bargain when compared with their much-hyped $175 Kobe Beef Burger. That's right, for less than two C-notes, one can enjoy a Wagyu beef burger with foie gras, aged Gruyère, shaved black truffles, golden truffle mayo, all dusted in gold leaf. It's available after 4:00 P.M. in the bar room only. But does Wall Street Burger Shoppe sell a lot of these tony burgers? "Well, ever since the press, it's kinda been like crazy," explains co-owner Heather Tierney. The motivation? "It’s kind of a promotion we did with Pocket Change which covers the most expensive things in New York. And they asked us to create the burger," says Heather. One of these days, when my wallet becomes overweight, I might give it a try. Maybe. Alas, I hadn't saved room for dessert. Not that there wasn't a lot of temptation, however. So many sweets, such as Financier Patisserie's Baba au Rhum and The Grill Room’s Vanilla Bean Crème Brûlée, beckoned. Next time? Most definitely! 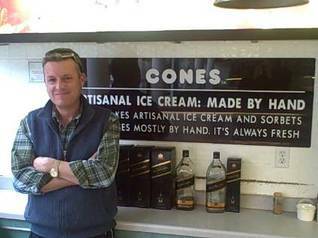 Opened roughly a decade ago by two brothers from Buenos Aires, Cones dishes up excellent handmade Argentine-style ice cream. Raul and Oscar D'Aloisio’s frozen wares have the consistency of gelato and come in some two dozen flavors including creamy zabaglione, yerba maté (a bitter, South American green tea), and dulce de leche as well as more traditional favorites like hazelnut. However, if you prefer something tart on a warm day, it's hard to imagine anything more refreshing than one or more of their dozen sorbets. You may wish to check out a couple of my personal faves, lemon and passion fruit. Raul ("the older one," as he puts it) offers me a couple of samples. The two-sample limit seems almost cruel. As with all good ice creams, Cones' do not rely on excessive sweetness to mask inferior-quality flavors. Their premium flavorings really stack up. 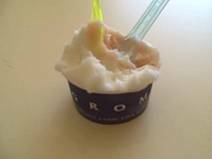 Grom founders Guido Martinetti and namesake Federico Grom started their first gelato venture five years ago in Torino (Turin). Since then, they've added more than a dozen stores in northern Italy. 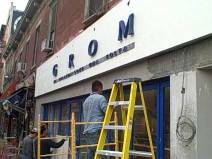 Last year, they opened the first Grom outside Italy, on Manhattan's Upper West Side. 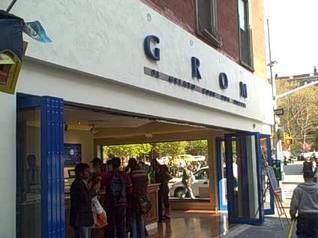 Last month, another new Grom began serving its frozen delights farther downtown in the West Village. I visited the latter shortly after the dust had settled. If it's not the best gelato or sorbet I've tasted, it's pretty darn close. While one could debate whose flavors are best, Grom's consistency is undeniably supreme. The gelato is silky and creamy; the sorbet is velvety smooth—more so than any sorbet, sorbetto, sherbet, or sherbert I’ve tried in the United States. The combination of luscious flavors and rich texture need not be a guilty pleasure, however. 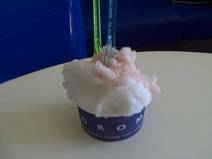 Grom uses natural ingredients and maintains that its gelati contain less cholesterol, fewer carbohydrates, and half the fat of super-premium brands. The menu changes monthly. I tried a small cup of limone (Sfusato lemon from Amalfi) and pompelmo rosa (ruby red grapefruit from Florida). The scoop: it was delicious, refreshing, and not too sweet—I could really taste the essence of the fruit. Grom's motto, Il Gelato Come Una Volta means, "gelato as it once was." While that may be true, the prices aren't quite so old-fashioned. 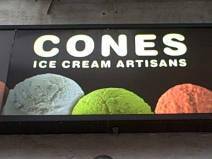 Cones and cups: small ($4.75); medium ($5.75); large ($6.75); extra large cup ($9). Quality comes with a price.